Sacro-Ease absorbs bone-jarring road shock and engine vibration. Ideal for truck and van drivers. Supports the back with adjustable cushion and internal rubber supports. 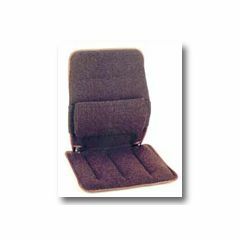 Brings driver from a slumped position, caused by soft seats, to a natural upright position. Increases alertness, shock absorption, and posture correction. Comfortable 1" polyfoam cushioning for 19" bench and 15" bucket seats. Five-year warranty. Black.